Welcome to your WholeLiving HQ, I’m Margaux Drake! Outside of running this WholeLiving kingdom for you, I’m WOTV 4 Women’s (ABC) Healthy Eats crew member, a regular healthy lifestyle contributor on eightWest WOOD TV8 (NBC) and I founded and lead two large virtual health and wellness communities called FUEL for weight loss, energy, healthy aging and FUEL+ for athletes. Why did I create this site? Because I am passionate about YOU. To educate, inspire and empower people to improve their bodies, homes and lives one little baby step or one giant step at a time. To help others find the ultimate in health and well being. To pour greatness into others so they can truly LIVE their lives like they mean it, EVERYDAY and have fun while doing it in style. In the process, these people will spark others to do the same and just like tossing a stone into water, the ripples will have a global reach. Think of MargauxDrake.com as a place where you can come for a reprieve, a deep breath, a momentary pause to soak up inspiration, information and empowerment. A refueling station for thoughts, ideas and creativity for a whole foods, plant STRONG diet, home, garden, fitness and personal development. A venue for all things that make up a life of hip, healthy WholeLiving. 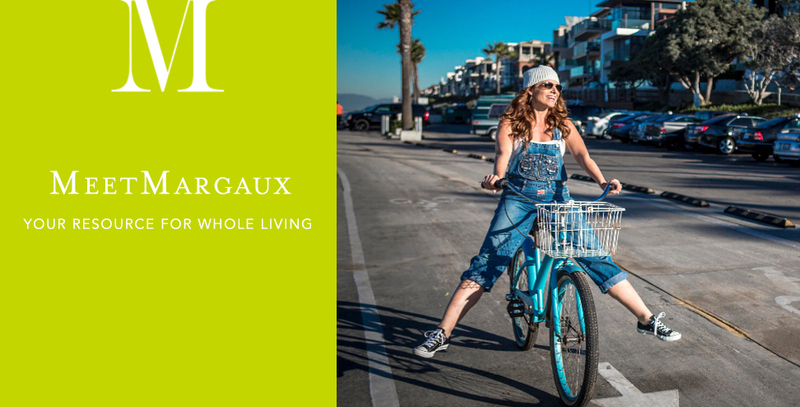 Join the WholeLiving community and the conversation where we can all share ideas daily on my Facebook page: Margaux Drake. I’ve THRIVED on a whole food diet for over 23 years. I brought into the world three healthy and beautiful children, inside and out, Stevie, Ellie and Teddy. I’ve completed three Ironman triathlons, finished many 1/2 Ironman races, ultra marathons, marathons, sprint distance triathlons and every other running race you can imagine all while fueling my engine with a whole foods, plant STRONG diet. I’m gluten-free too and have never felt better. I’m a certified chef, an Advanced Master Gardener, Master Naturalist and I have owned my own interior design consultancy for over 16 years. I take healthy lifestyle information and serve it up in a way that that makes life BEAUTIFUL and ABUNDANT. The ideal environment is profoundly inspiring and empowers us to give our best to the world. Set yourself up for success. If it has to do with health, wellness, home, garden, clean cuisine or fitness and putting it all together into an EXCEPTIONAL LIFE, I’m your girl. I’d also like to introduce you to my husband, the father to our three wonderful children, my business partner, training buddy, chief engineer and the guy who makes all of my crazy ideas come to life, Steve Drake. Without him, much of what you see here would not exist. Together, we make a DANG good team. I’ve inspired countless people to take control of their lives. I’ve poured my heart into this special place for YOU, in hopes that it educates, inspires and empowers you to TRANSFORM YOUR LIFE. You are POWERFUL BEYOND MEASURE. Just imagine what you can do. Margaux Drake is WOTV 4 Women’s (ABC) Healthy Eats crew member, D&W Fresh Market’s Living Well lifestyle expert and is also a regular contributor on eightWest WOOD TV8 (NBC). This certified chef, teacher and trainer owns The M.Drake Company–a home, garden and clean cuisine consultancy and she writes weekly about WholeLiving on MargauxDrake.com, and WOTV4Women.com-Living Well with Margaux Drake. Previously she was the Healthy Lifestyle Expert for the most progressive wholesale grocery distributor and retailer in the Midwest, SpartanNash representing their D&W Fresh Market brand and wrote weekly for Supermarket News, a national grocery industry publication, as an Xpert contributor for health & wellness on IdeaXchange. A graduate of The University of Michigan where her path healthy cuisine started over 25 years ago, Margaux LOVES whipping up whole foods into deliciousness and sharing her food with others. She is PASSIONATE about getting kids in the kitchen to play and to have hands-on involvement in the food they eat. She has over 16 years of interior design experience creating inspiring spaces nationally and internationally, for diverse clientele. Her philanthropy, The Giving Gardens, allows her use her knowledge as a Master Naturalist to restore ecosystems all over Michigan by spreading native plants and seeds. As an Advanced Master Gardener, she grows her own fruit, vegetables and herbs at home in her family’s organic kitchen garden. Margaux’s home, garden and clean cuisine are featured regularly in newspapers, magazines, radio, social media, on the web and television. In addition to her professional work, her other passions include her role as a wife and mother of three children, and as an ultra marathoner, Ironman triathlete and avid yogi. And, I’d LOVE to introduce you to my family (left to right): Teddy with Chester, Stevie, me, Steve and Ellie with Wesley. Our goal is to educate and inspire! WholeLiving is our brand of education, namely, providing instruction and advice, via print media, online media, and live classrooms, in the field of personal wellness including nutrition, health, alternative health, medicine, fitness, healthy lifestyle, parenting, personal relationships, spirituality, the environment, gardening, interior design, decoration, and popular science.